Passionate about doing for others, Donna’s decade of service with Truth Be Told is only a glimpse of her volunteer career, which spans over 6,000 hours. An increasingly-rare Austin native, Donna Snyder represents so much of what our community is about. She’s been part of the fabric of our government as a former attorney, she’s immersed herself in the arts, and most of all she’s made giving back to others part of her daily life. Donna’s service to others has been immeasurable over more than a decade since retirement, but collectively she’s amassed over 6,000 hours of volunteerism ranging from priceless strategic expertise to straightforward organizational administration. To put that into perspective, her unpaid volunteerism is equal to three entire years of full-time paid employment! Today, Donna’s heart lies with a small nonprofit called Truth Be Told, which works to break the cycle of incarceration for justice-involved women. She’s been engaged with Truth Be Told for well over a decade, after learning of their mission at a fundraiser and signing up to facilitate classes for women within our county correctional complex. After three years, she took on a similar role at the Lockhart women’s prison where she was a consistent presence for another five years. Today she’s joined the board of directors and served as co-chair, where the organization leans heavily on her legal expertise and navigation as they fight for incarcerated women inside a difficult bureaucratic system. 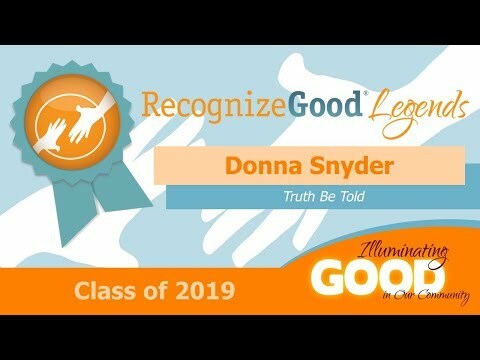 Her willingness to give of herself unconditionally knows no bounds – in addition to working on the front lines and in the board room as part of her staggering 4,000-plus volunteer hours with Truth Be Told Donna has also written curriculum, managed the newsletter, and spoken to large audiences on behalf of the mission. In addition, she has personally donated thousands of dollars, and has raised tens of thousands of dollars on behalf of the organization. Before and during her time spent with Truth Be Told, Donna has also donated thousands of volunteer hours over more than a decade with the Zach Scott Theatre by spearheading multiple committees and serving on their board. Additionally, she currently volunteers with the UT Astronomy Department and McDonald Observatory Board of Visitors, serving on multiple committees and as a board member. She’s also spent hundreds of hours in court as a Court Appointed Special Advocate (CASA) for foster children, and has been part of countless other volunteer organizations focused on women’s issues, workforce development and education. As if that were not enough, she still mentors University of Texas law students, cultivating a new generation of advocates by passing along her wisdom and passion.